CENTER REVIEW 50 • SHOPPING CENTER BUSINESS • October 2018 I vanhoe Cambridge's 1.2 million- square-foot Laurier Quebec is one of the most popular shopping destina- tions in Canada. The center, with its 265 retailers, 35 restaurants and 11 anchor stores, attracts 218,000 visitors per week. Located in Quebec City's Sainte-Foy dis- trict, with a population of more than 1 million residents, Laurier Quebec is the leading tourist destination after Old Que- bec, the historic district with landmarks that date back to the 17th century. 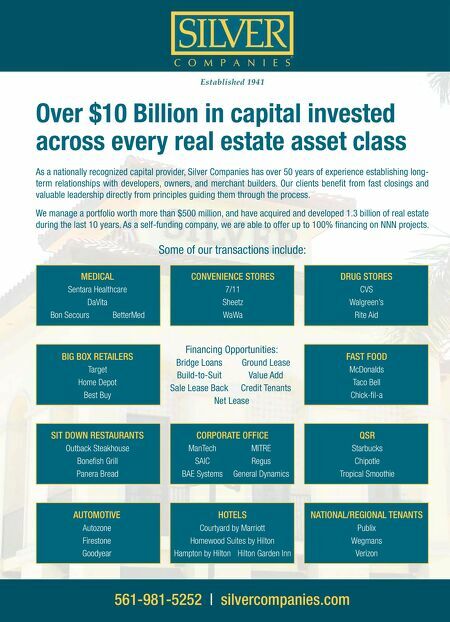 With its gross annual sales volume at al- most C$400 million with C$523 in sales per square foot and 11.2 million annual visitors, the center is a dominant force in the market, reinforced and complement- ed by Ivanhoe Cambridge's Place Ste-Foy shopping center. There's no doubt Laurier Quebec holds an important position in the local retail market, but there's always room for im- provement. A C$60 million redevelop- ment plan was announced earlier this year. It will completely revitalize Laurier Quebec's common areas, including new finishes, lighting, mall amenities, rede- signed washrooms and enhanced cus- tomer service. Julie Lafrenière, vice president of retail development for Ivanhoe Cambridge, says the focus of the project is to significantly enhance the customer's experience at the mall. And it all begins when a customer enters the site. In addition to dynamic sig- nage, a parking management system with digital sensors will be installed to inform drivers of available and occupied spaces. Parking areas will be further improved with new lighting and cosmetic improve- ments of the mall entrances. "It's a change in the way our customers will be able to approach the site before they even enter the shopping mall," says Lafrenière. Such a system was recently installed at Place Ste-Foy, which hosts 613,000 square feet of GLA. Ivanhoe Cambridge has also been investing in Place Ste-Foy, pouring approximately $400 million in both Place Sainte-Foy and Laurier Quebec since 2010. The company has been slowly upgrad- ing the center preceding the major over- haul. The C$60 million redevelopment follows an C$18 million redevelopment to modernize Laurier Quebec's food court, which paid off with a sales increase of more than 14 percent, according to the company. 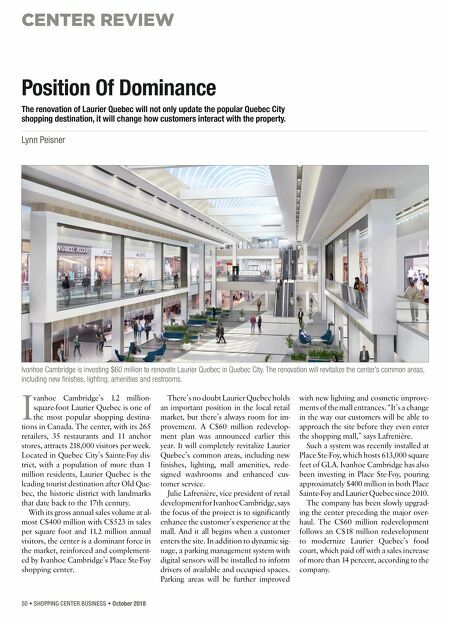 Position Of Dominance The renovation of Laurier Quebec will not only update the popular Quebec City shopping destination, it will change how customers interact with the property. Lynn Peisner Ivanhoe Cambridge is investing $60 million to renovate Laurier Quebec in Quebec City. The renovation will revitalize the center's common areas, including new finishes, lighting, amenities and restrooms.